(Bloomberg) -- Blue jeans are having a moment. At least that’s what J. Crew Group Inc. is hoping as it considers bringing its Madewell business to the public markets in the wake of rival Levi Strauss & Co.’s own $623 million offering. The potential spinoff “makes a lot of strategic sense because with a portfolio of brands -- some strong, some weak -- you are really restricted as to what you can do,” said Neil Saunders, an analyst at GlobalData Retail. Madewell is a fast-growing brand and its potential separation could help J. Crew deleverage some of its hefty balance sheet. But it would also join a newly crowded market for public jeanswear companies at a time when Americans are still leaning heavily toward activewear. Rival Levi went public last month, and VF Corp. is planning to spin off its jeans business, Kontoor Brands Inc., as a standalone company later this spring. Gap Inc.’s recent decision to split from Old Navy -- both of which are big players in denim -- introduces one more name to the mix. Meanwhile, imports of elastic knit pants surpassed those of denim for the first time in 2017, with the U.S. jeans category growing an anemic 2.2 percent last year after four straight years of declines. Libby Wadle will continue as president and CEO of Madewell. Meanwhile, new J. Crew chief Nicholson has his work cut out for him: While there’s been recent sales growth, cash on hand has been dwindling. The retailer had been without a chief since former CEO James Brett left abruptly in November. At that time, J. Crew set up an Office of the CEO, which was comprised of four senior company executives, including Wadle and Nicholson. J. Crew’s lenders cheered the prospect of an IPO of Madewell. The $1.5 billion loan due 2021 jumped more than 7 cents on the dollar to trade around 81 cents, according to people familiar with the pricing. The IPO of Madewell leaves the potential for lenders to either get paid in full or negotiate terms with the company, Ian Feng of Covenant Review said in an interview. 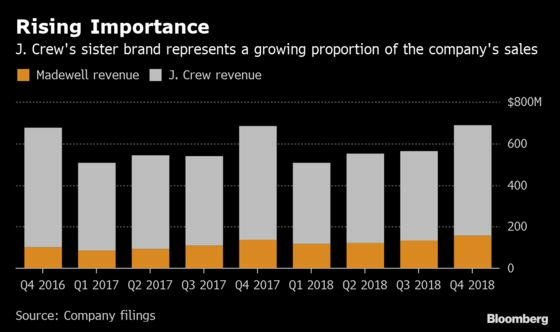 “If executed, a Madewell IPO could improve the capital structure and better position the company to address its debt,” said Raya Sokolyanska, a ratings analyst at Moody’s Investors Service. Because of the lenders’ amended debt documents, they are restricted from selling or leveraging Madewell without a majority of lenders consenting to the plans, he said. Maybe getting lenders to consent is easier if you give them a fee or negotiate, “but the idea is that the lenders under the term loan were smart enough to look ahead and realize this is a very valuable part of the company and they need to talk to use if they want to get rid of it,” Feng said.